Featuring a lower pommel/horn as well as free moving fenders, these close contact saddles make it easier to move with your horse for the best performance possible. 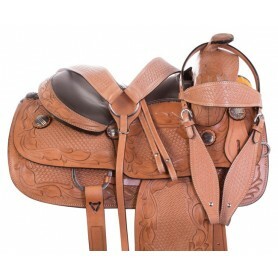 Hand Carved Classic Western Leather Reining Horse Saddle Tack 15"
This beautiful western reining saddle offers a classic look that features a hand carved floral and basket weave tooling on premium leather. Tan Hand Tooled Premium Western Leather Reining Horse Saddle Tack 15"